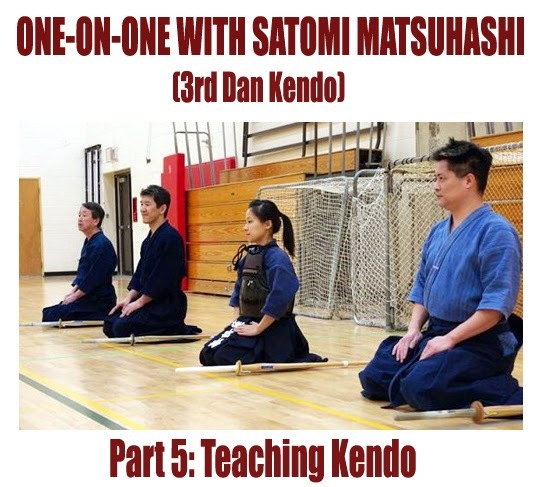 The following article is the fifth part of an interview with Satomi Matsuhashi (3rd dan kendo). In this article, Matsuhashi sensei talks about why she continues to practice and teach kendo. Question: You continue to practice kendo. Why do you do it? Matsuhashi: Well, I am a mom now with two kids. My son has a medical condition so it is hard at times. I was looking for a place to have "time to be me again". When I am in my bogu, I can try to be ME again. Question: Can you explain in more detail what you mean? Matsuhashi: Finding my weakness and working on it by refocusing and meditating. This is what I was taught by my teacher. It helps me to be away from my duty at home for my son for a little bit and allows me a chance to refresh my mind. So that I can go home to be a better mom. Question: You volunteer to help instruct the kids' kendo class at Nikka Gakuen. How did you find them? Matsuhashi: After I came to Canada, I hadn’t found a kendo dojo I really wanted to join. Someone suggested that I go to the Japanese Canadian Cultural Centre and I went there and tried a few classes. I got a taste of doing real kendo again at the JCCC. I liked it. I really did. Then, the network of Japanese moms told me that the Japanese school Nikka Gakuen* had a kids’ kendo club. So, I contacted them. Question: Why did you choose to join Nikka Gakuen Kendo Club? But I thought those kids were so innocent and I saw that Sumi-sensei* was being a really good role model for the kids, teaching them with passion. Also, I talked to my friend's husband*, who has a lot of experience with various martial arts, about my wanting to find a kendo club to practice at and my one bad experience with the kendo club near my house. He said to me, "Find a teacher you truly respect and follow him or her". So, all these things made me think "this place might give me some good learning experiences", instead of getting quick satisfaction by, like just going in and out of a gym for exercise. 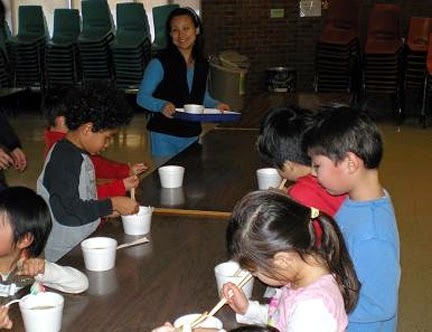 Matsuhashi sensei helping out feeding the kids at Nikka Gakuen Kendo Club’s Kagami Biraki ceremony. Kagami Biraki is a traditional Japanese ceremony to mark the start of a new year. For more information, see: Kagami Biraki. Question: It is very far for you to travel. You are not paid for your gas or your time. So why do you continue to help? And my mother told me in those moments when I told her I was discouraged, "Satomi, there always will be wind against you when you try something different or new. Don't let it take over you." I thought about what they told me for a while, and I realized I had emotionally kind of started feeling attached to those kids and also my daughter was enrolled in this club. She looks at me as a role model. I thought about all the pictures I showed my daughter of my early kendo days, my talks with her about not being discouraged about being called "small", she remembered all that. And here I am thinking about quitting...? These things, in a way, keep me in this club. I often think "what makes a good teacher? ", "how can I guide and encourage these kids in a better way? ", "how can I be useful to this school?" The Nikka Gakuen Kendo Club. Question: Can you elaborate on why it is important for you to be a role model for your daughter? Matsuhashi: My daughter is short. So she does not like to be acknowledged as such when people say, "Oh, you are so tiny" or some parents use her height to show how big their own kids are. So it hurts her a lot especially if they are younger than her. I do know exactly how she feels (as you notice I am short, too). So I want to encourage her more than ever. Being small should not limit her will if she is willing to fight and persevere. My sister was a very smart girl without much effort. She always teased me that a small person would never do well without specific skills. I had to prove myself. 1. To mould the mind and body. 2. To cultivate a vigorous spirit. Having to prove herself made her a fierce competitor in kendo. Matsuhashi senshu is an excellent role model from a technical standpoint. Her kendo is very strong, powerful, clean, crisp, and precise. But she is also an excellent role model in terms of character as well. Her dedication to volunteering at the Nikka Gakuen Kendo Club, for the benefit of the kids without pay or reward, epitomizes the very highest principles of kendo. This is service to the community, giving back. And like her teacher before her, guiding and nurturing the next generation of citizens by instilling values and building character. This is the spirit of kendo. Douglas Tong began his studies of Yagyu Shinkage Ryu with the late Mutou Sensei (Kajitsuka sensei’s teacher) in Zushi in 1992. Mr. Tong can be contacted via email at: tong@tokumeikan.org or at doug@dragonfencing.com. COMING SOON – THE FINAL PART OF THIS EXCELLENT INTERVIEW!